Many Rockstar fans were no doubt surprised by the developer’s announcement earlier this week that a new Red Dead Redemption game would be released in fall 2017, because it seemed that such an announcement came out of the blue, but this really wasn’t the case. Actually, Rockstar had teased gamers earlier in the week with a mysterious image showing a series of figures in the background wearing cowboy hats, no doubt a hint that a Red Dead Redemption announcement was coming. Before that the company had even released a new picture of its logo in the familiar Red Dead Redemption colours, another no so subtle hint that a new Red Dead Redemption game was in the pipeline. And gamers could hardly contain their excitement when Rockstar officially announced that Red Dead Redemption 2 was indeed happening and that it would be hitting the shelves in fall 2017, as the original Red Dead Redemption was one of the best games of the past generation no doubt. That game featured great open world gameplay, a memorable cast of characters including outlaw protagonist John Marsten and Mexican revolutionary Abraham Reyes, and a superb single player campaign. 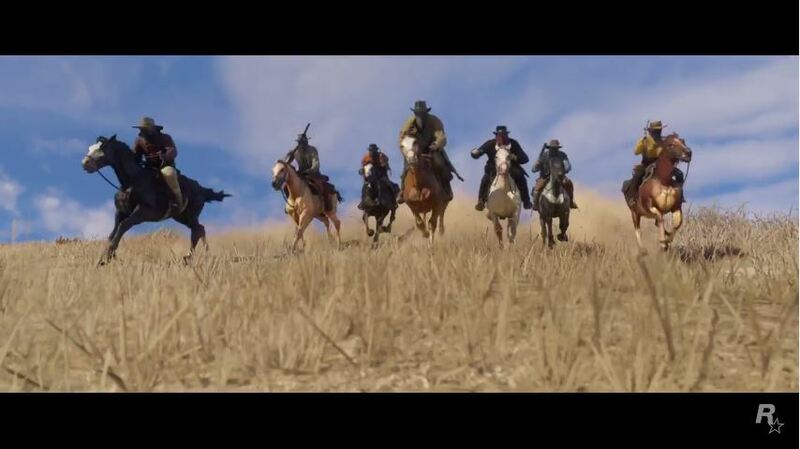 Rockstar has now released the first trailer for the game which shows Red Dead Redemption 2’s beautiful Wild West setting, with seven cowboys riding into the horizon at some point in the trailer, who may be the game’s protagonists as some pundits have suggested. This first trailer for Red Dead Redemption 2 no doubt looks good, but it remains to be seen whether Rockstar will focus more on the multiplayer side of things given the success of GTA Online and deliver a less polished single player campaign, which is something that some have raised concern about. But still, given Rockstar’s track record it is hard to think that the American outfit will fail to deliver and not release a stellar sequel to their 2010 hit Red Dead Redemption come fall 2017.